I am fascinated by compote. It works very well with any base , cakes, pan cakes, custards, breads and even plain chapatis. My kiddo is big on fruits too, so this is good treat for him whenever I run out of ideas for his tiffin. While compote is an easy recipe to make you can do away with the long standing in front of the stove top by making this simple bake in tray recipe. You can also add fruits of your choice I made a large batch before monsoons when fresh cherries were available. Like jams and jellies this can also be stored for many days and weeks. For adults, you can experiment with alchohol of choice as the liquid base - wine or rum are suggested additions. 1) In a large deep baking tray, add the water and sugar. Let it dissolve completely. 2) Now add the fruits to this water. You can let them stand for an hour. 3) Preheat the oven in the meantime to 160C. 4) Place the baking tray in the oven and bake the mixture for an hour or until the water is almost evaporated. 5) Remove and use as a topping on cake or as is. 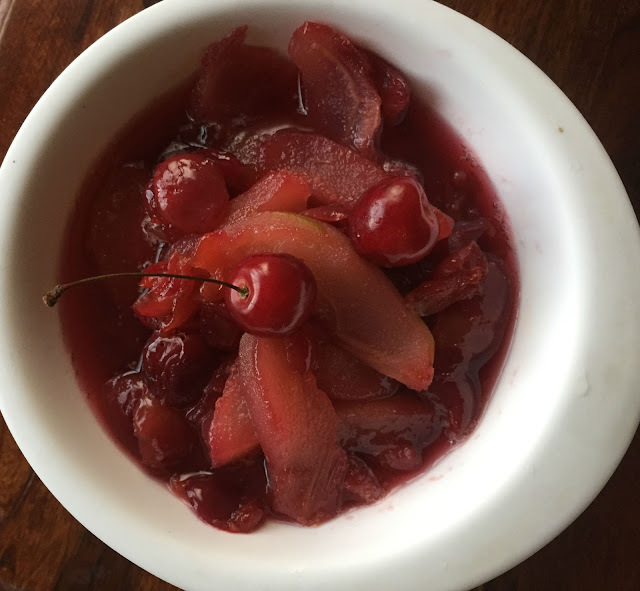 As Kalyani mentioned, baking compote sounds simple. My daughter would probably love this on her pancakes.